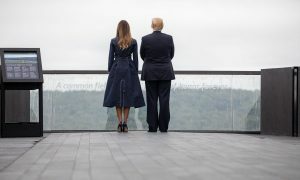 President Trump and his wife Melania Trump at the site of the Flight 93 crash in Shanksville, Pa., via White House. President Trump seized on the 17th anniversary of the Sept. 11 terrorist attacks to launch dubious assaults on the FBI and Justice Department. The president repeated an unfounded allegation by Rep. Mark Meadows, R-N.C., who claimed former FBI officials Peter Strzok and Lisa Page employed a “media leak strategy” to undermine his administration, the Washington Post reports. Trump then criticized the FBI and Justice for failing to act on the dubious claim. Strzok’s attorney said the “media leak strategy” was referring to an effort to tackle unauthorized disclosures to reporters. Posted: September 12th, 2018 under News Story. 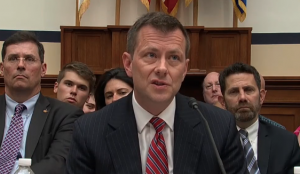 Update: Sunday, 11:44 p.m. — The GoFundMe page for fired FBI agent Peter Stzrok has now raised $439,455 in six days. The goal was raised from $350,000 to $500,000. Peter Stzrok, the FBI agent who was ousted for sending anti-Trump text messages during the presidential campaign, has plenty of supporters. Just take a look at the $235,000 that was raised just 21 hours after the GoFundMe page was created by an anonymous organizer, listed as“Friends of Special Agent Peter Strzok,” on the day news broke that the 22-year veteran had been fired over the recommendations that he be demoted and suspended for 60 days. In less than 12 hours, the original goal of raising $150,000 for his future legal bills was exceeded by thousands of donors. The goal was then raised to $350,000. A similar outpouring of support happened in April after FBI Deputy Director Andrew McCabe was fired just two days before he was eligible to retire with full benefits. More than $500,ooo was raised, more than tripling the fundraising goal. Strzok’s attorney, Aitan Goelman, slammed the decision of FBI Deputy Director David L. Bowditch, who overruled an internal disciplinary review that had recommended Strzok a demotion and suspension. Peter Strzok, a man who has spent his entire life working to help keep us and our nation safe, has been fired. He needs your help. 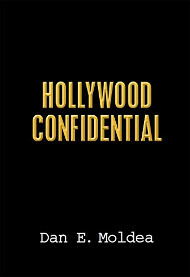 Posted: August 19th, 2018 under News Story. Peter Strzok testifying on The Hill. The FBI has fired Peter Strzok for sending anti-Trump text messages to his lover during the presidential campaign. Strzok attorney Aitan Goelman confirmed FBI Deputy Director David L. Bowditch ordered the termination Friday, overruling an internal disciplinary review that had recommended Strzok be demoted and suspended for 60 days. “The decision to fire Special Agent Strzok is not only a departure from typical Bureau practice, but also contradicts Director Wray’s testimony to Congress and his assurances that the FBI intended to follow its regular process in this and all personnel matters,” Goelman said, according to Politico. The FBI declined numerous news agencies’ requests for a comment. Strzok, a 22-year veteran of the bureau, was among the lead investigators of Russian interference during the 2016 election until the anti-Trump text messages were discovered by a Justice Department inspector general. Special counsel Robert Mueller immediately removed Strzok from the team investigating Russia. The politically charged texts were amplified by the president and his supporters as evidence that the investigation into Trump and his campaign was biased. The texts were sent to an FBI lawyer, Lisa Page, who also was part of Mueller’s team. Investor’s Business Daily Editorial: Did FBI Ignore Evidence That A ‘Foreign Entity’ Hacked Clinton’s Emails? Email Scandal: Last week we learned that a “foreign entity” may have been secretly receiving Hillary Clinton’s emails while she was Secretary of State, including many that contained classified information. And that the FBI apparently ignored this information during its “investigation.” The reaction by the press to this bombshell? Crickets. Posted: July 19th, 2018 under News Story. 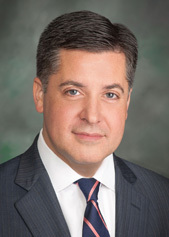 Joseph Moreno is a former federal national security prosecutor with the U.S. Department of Justice and a former staff member to the FBI 9/11 Review Commission. He is now a white collar litigation partner at Cadwalader Wickersham & Taft. 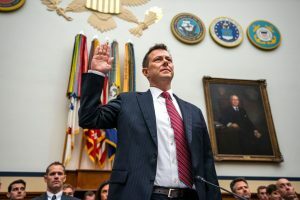 The House committees opted to haul (Peter) Strzok before them for multiple days to repeatedly revisit the issue of his alleged bias against President Trump. 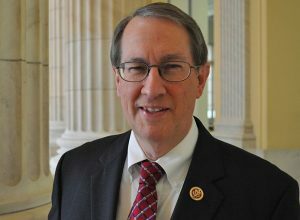 Instead of applying a careful investigative approach, Republicans in the majority seemed primarily intent on using the Strzok hearing to cast doubt on the FBI and the Mueller investigation. The minority Democrats, understandably frustrated, did themselves few favors by veering too far in the opposite direction by heaping praise on Strzok. They likely would have been more effective had they simply issued a statement condemning the hearing and walked out. These are serious times that call for serious oversight. The House committees had a prime opportunity to conduct a real hearing, sort out true issues versus distractions, and focus on restoring confidence in the FBI and another serious investigation, which is that of the special counsel into Russian meddling with our American election system. We know the Russian government conducted active measures to interfere in the 2016 election. The intelligence community, the House, and the Senate have all confirmed this. We know that Mueller has conducted a professional investigation that has borne more fruit with indictments of Russian intelligence officers for hacking networks and email accounts related to the Democratic Party. We know the special counsel team has secured guilty pleas relating to multiple individuals associated with the Trump campaign for lying about their interactions with Russians. Posted: July 17th, 2018 under News Story. U.S. Rep. Louis Gohmert of Texas. 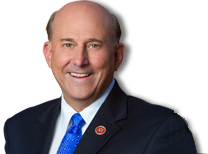 U.S. Rep. Louis Gohmert of Texas says he’s talked to FBI agents who think agent Peter Strzok has gotten away with murder. Republicans beclowned themselves in a committee hearing Thursday as they desperately tried to discredit FBI agent Peter Strzok. Strzok is the deep-state punching bag of President Trump because, while heading up investigations into both Russian interference in the Trump campaign and Hillary Clinton’s email server in 2016, he said negative things about the man who would be President to Lisa Page, the Justice Department lawyer with whom he was having an affair. Ergo, claims Trump, Strzok and Page were key operatives in a vast left-wing conspiracy to bring him down. Which means everything that follows, including Robert Mueller’s special counsel investigation, is fruit of a poisonous tree. 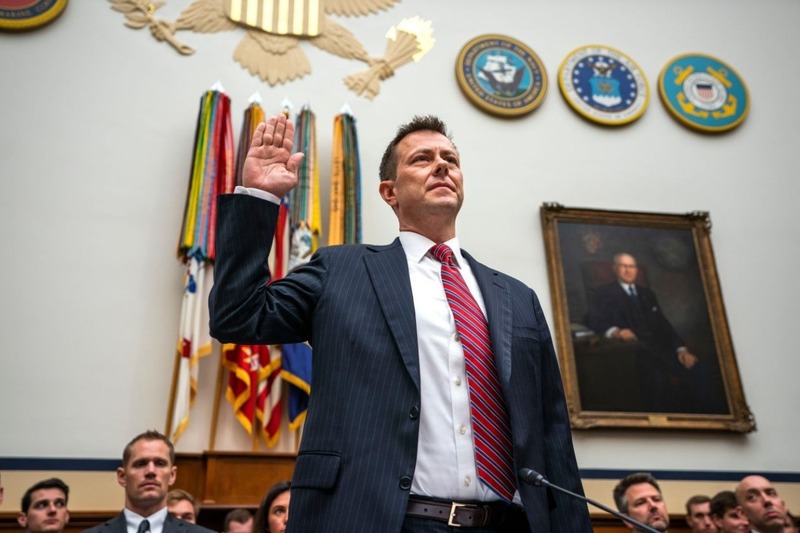 The caricatures come easy to the President and his cronies in Congress, who Thursday tried to brand Strzok a political henchman and, for good measure, untrustworthy philanderer. As they stooped to new lows to smear a public servant, it was Republican Reps. Trey Gowdy and Louie Gohmert who showed themselves to be faithless cowards. To read full editorial click here.